February 13 is the last day to vote in the People's Choice Stevie Awards for Favorite Customer Service, a feature of the Stevie Awards for Sales & Customer Service. 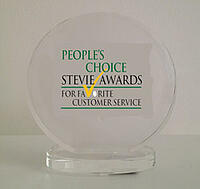 Winners of the crystal People's Choice Stevie Awards will be celebrated at an awards gala at the Bellagio Hotel in Las Vegas, Nevada, USA, on February 27, 2015. Past winners include Apple, CardioVet, Constant Contact,Cvent, Marriott Vacation Club, PetRays, Rosetta Stone, and Vonage.